By now, you have received your assignment from my office! 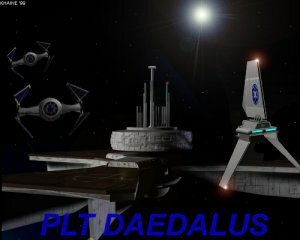 Just to reiterate what was in your welcome letter, you have been placed in Modified Platform Daedalus, where you're expected to complete your training. To complete your training you must first fully read and understand Emperor's Hammer Bylaws and the TIE Corps Pilot Manual, both to be found on the menu bar at your left ('EH Rules & Regulations' and 'Reference & Manuals' sections respectively). Though not necessary at this point, you may also be interested in our Articles of War, Cheating Policy and Emperor's Hammer Training Manual. When you think you've fully understood the first two basic documents, please feel free to e-mail me directly to the address you'll find below this transmission telling me about it. I'll take your word as an imperial officer thus giving you your first assignment. We have many resources available for Cadets such as yourself to give you every opportunity to complete basic training, but it's not for the weak or undetermined. This is where you are given the chance to prove yourself worthy of combat to fight on behalf of The Empire! Once your training is complete, you will be assigned into one of our active squadrons with some of the best starfighter pilots in the galaxy! And, if possible and appropiate, I'll personally see to it that your first squadron assignment will be to the squadron you selected when you joined the Fleet. Questions? Comments? General Discussion... speak your mind here!